Lawrence Block's talent for creating colorful characters, sophisticated dialog, and engaging atmosphere has earned him many awards: the title of Grand Master, three Edgar Awards, four Shamus Awards, and a Nero Wolfe Award. 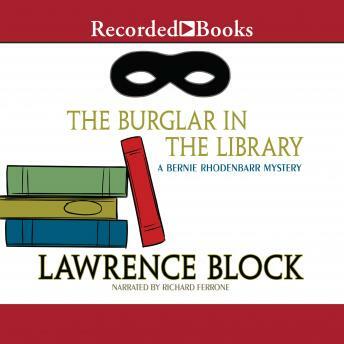 One of his most popular series follows the adventures of the suave bookseller and crook, Bernie Rhodenbarr. Bernie's sweetheart has dumped him. But although his heart is broken, he hasn't lost his love for fine books-or for an occasional discrete burglary. So Bernie takes off for a snowy winter weekend at a country inn that just happens to have a rare, signed first edition of The Big Sleep in its library. It's not long, however, before Bernie's ex-girlfriend arrives with her new husband, a body is found in the library, and the book disappears. Bernie must sort out a tricky tangle of clues if he has any hope of nabbing the priceless edition for himself. Narrator Richard Ferrone captures Bernie's cool demeanor and his flair for perfect timing.